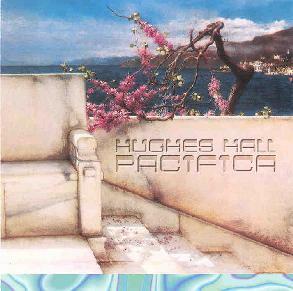 Hughes Hall is a multi-instrumentalist who has distinguished himself in the area of film music. This is his first album, a work in which he tries to fuse together a number of different instrumental styles and influences, from Weather Report and Pat Metheny to Ozric Tentacles and Steve Hillage. From my point of view, it tends to lean towards the first two of those influences, failing really to capture the trippy vibe of the latter mentioned artists. Tracks like Turning, with its muscular piano and guitar lines, and Big Valley (certainly the best song on the album), with its grooving sequences and great guitar work by guest musician Jeff Scott showcase the progressive side of Hall's interests, but other pieces such as Waiting and Tuesday border on new-agey mellowness. It's a smooth sound, to be sure, but that's not necessarily always a good thing. I get the feeling the album may have benefited from looser, rougher production, and some more improvisation as well. It may have allowed Hall to stretch out a little more, musically, and really explore his influences. Although Hall does some fine guitar playing throughout the album, the guitar often has a strangely softened quality, or gets buried within the mix, as if Hall is afraid to actually cut loose and rock out. Admittedly, Pacifica is a very accessible, listener friendly album. For all its ambitions though, it doesn't quite reach the heights it aims for. Hall fails to take the risks that the artists that have influenced him do. Still, it is only his first attempt, and with ambitions like his, we may yet hear some great stuff from this talented player. For more information you can visit the Hughes Hall web site at: http://www.hugheshall.com. Contact via snail mail c/o Hughes Hall; 1832 El Cettito Pl #2; Los Angeles, CA 90068.